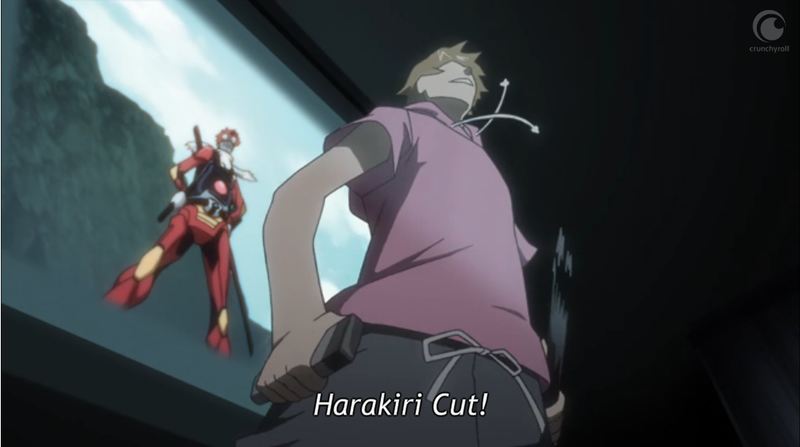 Summary: Masayoshi Hazama, a man who has become a superhero “by himself” with no superhuman powers or any sort of high-tech conversions, and Hidenori Goto, a cop who constantly gets in trouble thanks to Hazama. This is the story of the birth of a true hero featuring these two young men with a touch of comedy and serious drama. First Impression: Almost out for too much Comedy, and then right up high on the list for Drama. First Opinion: Damn man. Talk about flipping the coin in just one episode. Half way through the episode I was almost ready to toss this one for the season, the played-straight comedy was getting so thick I couldn't stand it. I know a good lot of people who really enjoy that kind of comedy, but it's not my thing. Then, right at the end of the episode, it flips into a seriously solid dramatic moment. My best advice: Take to heart that the opening ends as a dream, don't let it set the tone of your expectations, and ride the first episode to the end. The beginning is a whole lot of character and tone set up. They even use In Medias Res to help define a character. That's a fair risk to do that for something like an episodic anime series, although the risk is lessened by containing it within a single episode. As used in this case, it was a fairly complicated way to play out character introductions, an unnecessary but flavorful bit of spice.